155 published items with the word (s) or phrase Juicy Couture in News, Trends, Videos, Photo galleries, Agenda and sorted by "date descending". From autumn/ winter 2019, Bikkembergs has licensed its footwear collection, previously with Zeis Excelsa, to the Global Brands Group, a leading apparel, footwear and accessories manufacturer. Juicy Couture, a subsidiary of Authentic Brands Group (ABG), has announced a new partnership with K&S Outerwear, a New York-based apparel and accessories designer and manufacturer specializing in outerwear. Juicy Couture Girls is set to launch two new Spring/Summer 2019 collections of girls' childrenswear under its Juicy Couture Black Label and Juicy By Juicy Couture label, exclusively in the UK and Europe. The California fashion brand announced on Tuesday that it has signed a new leather and outerwear licensing deal for Europe with Düsseldorf-based manufacturer Platinum 3 Fashion GmbH. Topshop Beauty is making a comeback. The British fashion retailer is making beauty dreams come true by bringing its makeup line back into stores this November. Juicy Couture has reportedly got a makeup collection up its velour tracksuit sleeve.The LA-based fashion brand has been working on its debut cosmetics line, dubbed ‘Juicy Couture Color Collection,' according to reports. Juicy Couture has unveiled its newest fragrance, with the help of models Devon Windsor, India Graham, Gizele Oliveira, and Luping Wang. ...Juicy Couture se moque gentiment de l'industrie des influenceuses sur Instagram et YouTube pour sa nouvelle campagne automne 2018. ...e-commerce.GBG fait partie du Fung Group et possède les licences d'un grand nombre de marques, dont Under Armour, Juicy Couture, Kate Spade New York et All Saints. ...Fry es la primera marca en ser propiedad de ambas compañías.La cartera del grupo Authentic Brands también incluye a Juicy Couture, Aéropostale y Tretorn. ...dell’accordo di licenza per il design, la produzione e distribuzione delle collezioni di occhiali da sole e da vista ‘Juicy Couture’. ...GBG ist Teil der Fung Group und verwaltet Lizenzen für mehrere Dutzend Marken, darunter Under Armour, Kenneth Cole, Juicy Couture, Kate Spade New York, Katy Perry, Fiorelli und All Saints. ...die erste Marke, die den beiden Unternehmen gemeinsam gehört.Das Portfolio der Authentic Brands Group umfasst auch Juicy Couture, Aéropostale und Tretorn. ...Urban Outfitters ist eine neue Partnerschaft mit Juicy Couture eingegangen. Die gemeinsame Kollektion besteht aus Velour-Trainingsanzügen, Bandeau BHs und einem Bodysuit. R&B Sängerin Tinashe wird Markenbotschafterin. ...Для создания аромата “Oui Juicy Couture” калифорнийский fashion-лейбл Juicy Couture объединил усилия с косметическим гигантом Revlon. А прорекламировать свой новый продукт пригласил известных моделей. ...«ДжамильКо» основана в 1993 году и является российским дистрибьютором таких брендов, как DKNY, Escada, John Lobb, Juicy Couture, Lee Cooper, Marc O'Polo, New Balance, Timberland, Salvatore Ferragamo и др. ...A Juicy Couture vai estrear na Semana da Moda de Nova York. O desfile de outono / inverno 2018 trará as linhas Juicy Couture Black Label e Juicy by Juicy Couture. ...Después del lanzamiento de la primera parte de la colección cápsula a principios de este año, Juicy Couture y Urban Outfitters se unen para la segunda parte. ...A Juicy Couture vai estrear-se na Semana da Moda de Nova Iorque. O desfile de outono- inverno 2018 trará as linhas Juicy Couture Black Label e Juicy by Juicy Couture. ...(Relaxnews) - A Juicy Couture, nomeou Jamie Mizrahi, estilista e queridinha de estrelas americanas, diretora artística da marca californiana, informou a WWD. Ela sucede Roi Elfassy. ... Global Brands Group currently has in its portfolio, either as licensed or directly operated brands, labels like Juicy Couture, Calvin Klein, Ellen Tracy, Frye, Kenneth Cole, Katy Perry, AllSaints, Kate Spade and JLO. ...Juicy Couture, a subsidiary of Authentic Brands Group (ABG), has announced a new partnership with K&S Outerwear, a New York-based apparel and accessories designer and manufacturer specializing in outerwear. ...Juicy Couture Girls is set to launch two new Spring/Summer 2019 collections of girls' childrenswear under its Juicy Couture Black Label and Juicy By Juicy Couture label, exclusively in the UK and Europe. ...September saw US department store chain Belk unveil its debut in-house beauty brand, while LA-based fashion label Juicy Couture has also reportedly got a makeup collection up its velour tracksuit sleeve. ...Juicy Couture has unveiled its newest fragrance, with the help of models Devon Windsor, India Graham, Gizele Oliveira, and Luping Wang. ...New Delhi, and hosts a large number of international fashion brands such as Zara, Marks and Spencer, Hunkemoller, Juicy Couture, and Chanel Beauty, among others. The malls boasts 4.6 lakh of retail space. ...Conversely, brands that do not stand up well in the resale marketplace, according to the report, include Giorgio Armani, Juicy Couture and Mango. 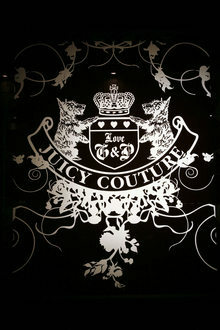 ...Juicy Couture has been relaunched by stylist Jamie Mizrahi who showed the brand at its first NYFW show last month. The relaunch includes a partnership with Swarovski Crystal to bring the brand's iconic tracksuit back. ...through e-commerce.GBG is part of the Fung Group and owns licenses for a number of brands including Under Armour, Juicy Couture, Kate Spade New York and All Saints.